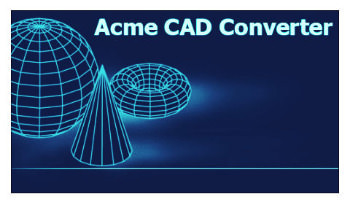 Acme CAD Converter is a dwg dxf dwf format conversion software for batch and vector files. It can conveniently convert DXF,DWF and DWG files into WMF BMP, GIF,JPEG,TIFF,PNG,TGA, DXF, DWG, SVG , PDF, HPGL, CGM, EPS etc., and also enable the conversion between DXF and DWG file versions (R2.5-R2018).Supports replace font file. Supports eTransmit command like AutoCAD,and batch recover drawing files.